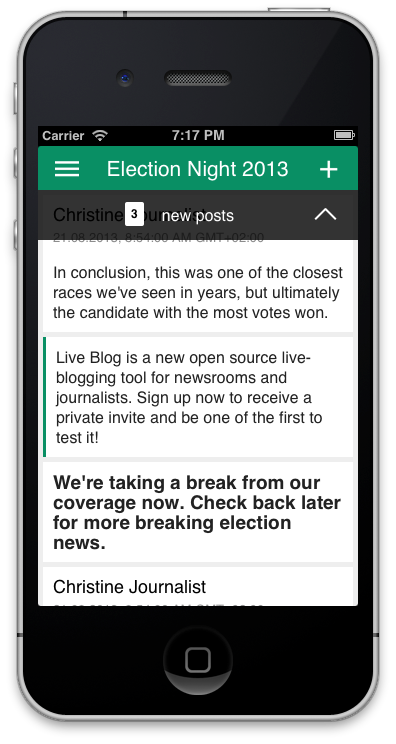 Live Blog’s mobile app allows for your live blog team to contribute directly from their mobile phones. 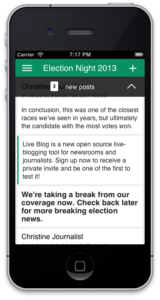 Working on both iPhone and Android devices, all you have to do is download the Live Blog Reporter app, log in with the credentials you use for your Live Blog instance and contribute to assigned blogs straight away. To include social media content in your Live Blog, simply copy and paste the social media post’s URL (or embed code) into the Live Blog editor and publish. 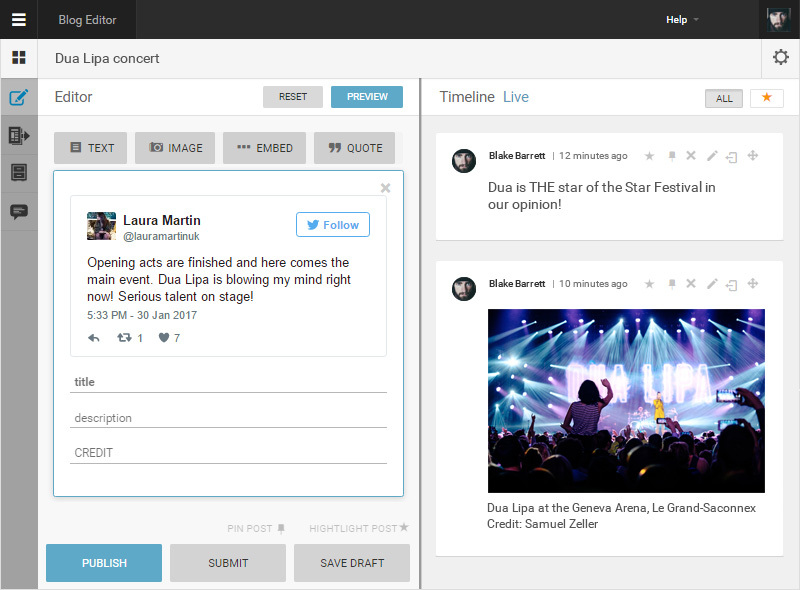 Live Blog relies on embed.ly, a service that provides access to 400+ social media content providers. Oscar night, fashion shows and Carnival: these are just some of the events where images are one of the main points of interest for a live blog audience. With the image slideshow feature, instead of publishing just one image in a post, you can arrange multiple images and present them as a photo collection to your readers. Deliver a multimedia experience by including image slideshows, video streams and other types of multimedia in your feed. 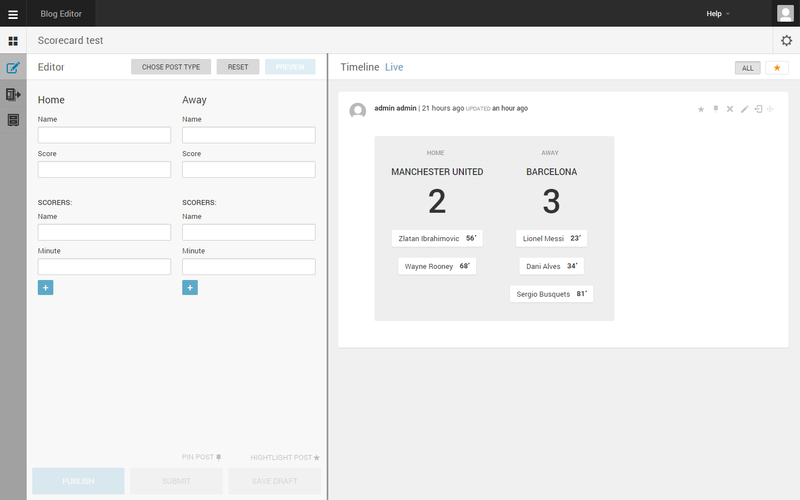 Live blogging a sporting event requires data to be presented in comprehensive and engaging ways. We’ve developed a Scorecard feature to help your readers keep track of the score, as well as become informed on additional information like who scored and in what minute of the game. 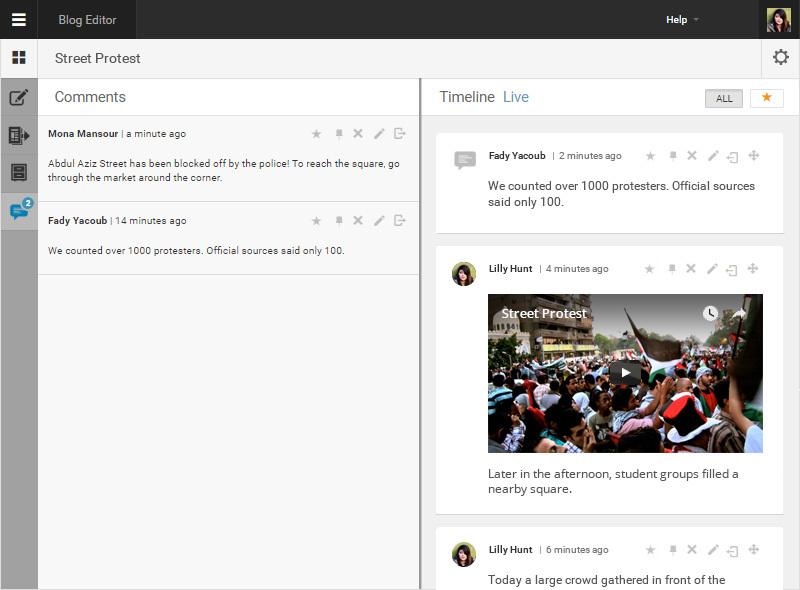 Live Blog’s user commenting function allows you to incorporate direct feedback in real time. Readers can share their opinions on the event you’re covering, contribute valuable information and provide you with eyewitness reports. In version 3.4, the user commenting feature is also available for the AMP output, so your readers can directly engage with your live blog through their mobile phones. 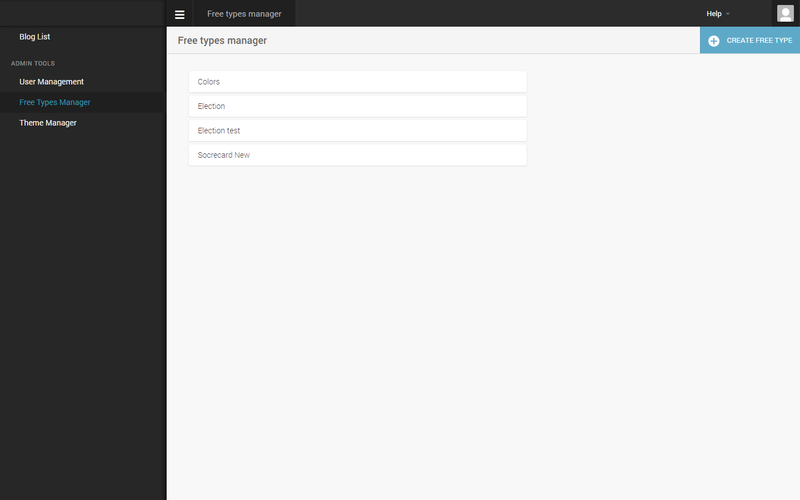 Our Free Types Manager allows you to create unique post types so that you can best cover your event. All you have to do is develop an idea of how best to present an aspect of your event and then, using some basic HTML knowledge, create your own custom post type to carry it out. Let’s say you were planning to cover an election. You could develop a custom post type that created a table so that you could keep track of each party’s results. Then every time a new update became available, all you’d have to is update the table. What other free types can you imagine? We’re really looking forward to seeing them in use. Live Blog’s Analytics feature allows you to track the unique pageviews your live blog receives in each place your blog is embedded. The Analytics feature is available in both the Default and Classic theme, and requires no additional setup. Customise Live Blog to match your site’s design. 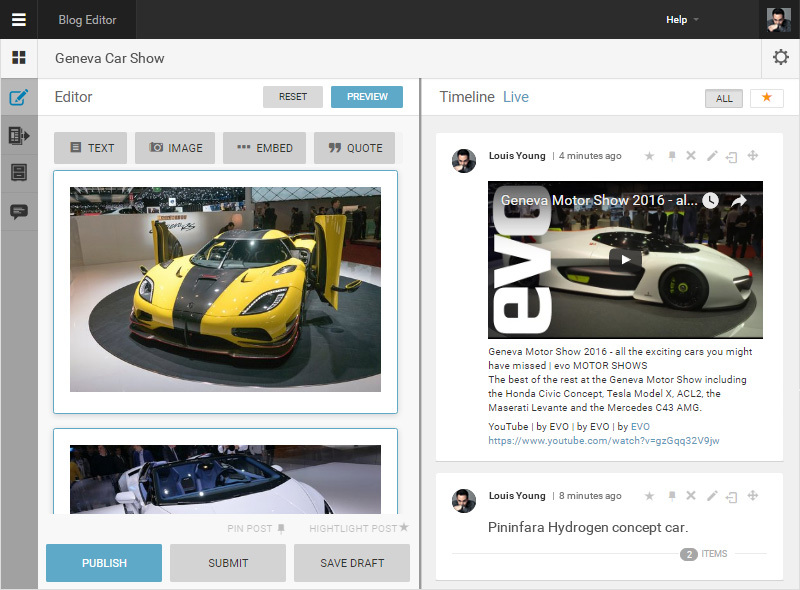 Live Blog’s multiple themes allow you to use one Live Blog instance across different sites and devices. In version 3.4, we’ve made our theme management even more versatile by allowing you to override certain components in your chosen theme while still maintaining desired elements. In terms of unique visitors and average time spent on a page, many live blogs are more successful than regular news articles. However, since it requires two to three editors to properly cover an event and curate social media content at the same time, live blogging can also be an expensive format. One way to monetise your live coverage is by integrating native or remote ads into your live blog’s timeline. Our post types allow you to either add an advertisement zone from your ad provider into a post and publish it to the timeline, or create a native ad consisting of text, image and a link target. Both forms of ads are also configurable in the AMP theme, meaning readers can also engage with ads on their phones. One way to monetise your live coverage is by integrating ads into your live blog’s timeline. Our post types allow you to create a native ad consisting of text, images and a link target, as well as remote ads by allowing for advertisements zones from your ad provider to be easily included in posts published to your blog’s timeline. Both forms of ads are also configurable in the AMP theme, meaning readers can also engage with ads on their phones. 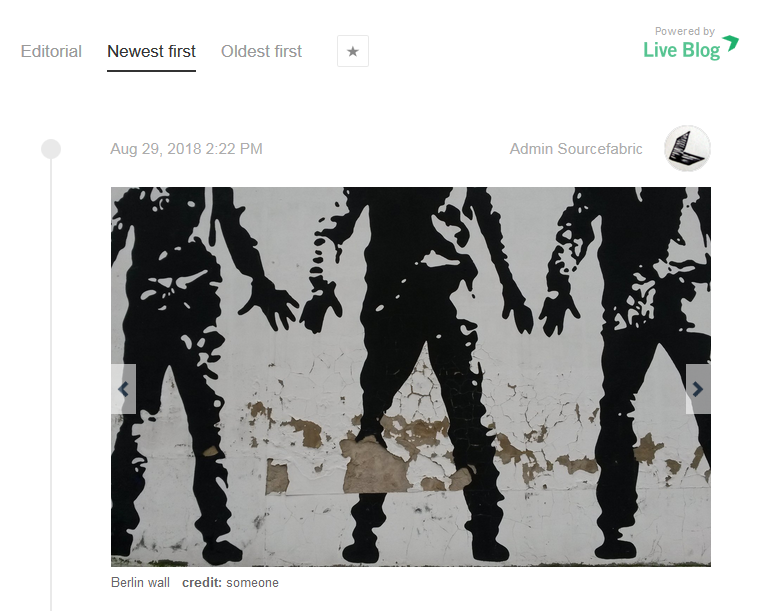 Live Blog Solo users have two free support hours a month. These hours are available every business day (Monday to Friday, except for public holidays in Berlin) from 09:00 to 17:00 CET/CEST. Our guaranteed initial response time for high priority tickets is 16 business hours. Live Blog users who are part of the Team package have four free support hours every month. These hours can be used on business days (Monday to Friday, except for public holidays in Berlin) from 09:00 to 17:00 CET/CEST. Our guaranteed initial response time for high priority tickets is eight business hours. Details about support packages for Live Blog Corporation subscriptions are available on request. 24/7 support is available.